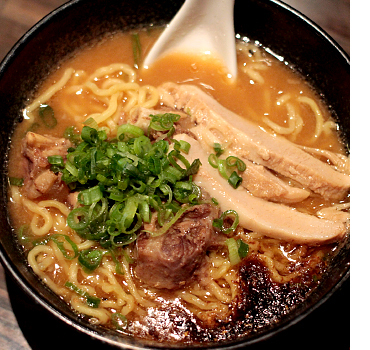 All over the world,“Ramen” is becoming the next popular Japanese cuisine after “SUSHI”. 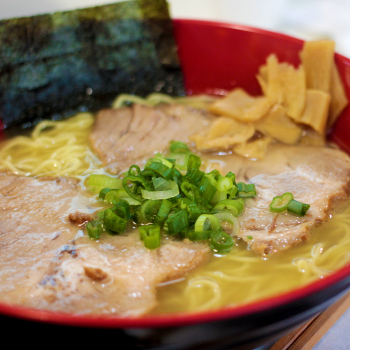 It’s no exaggeration to say that Vancouver is one of most competitive RAMEN battleground. LifeVancouer went out to eat as many Ramen as we could, to compile the “Ultimate Ramen Guide Vancouver”. 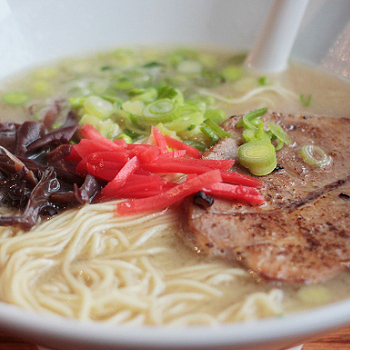 Tastes & opinions vary, but we hope our reviews give you an insight into the Vancouver Ramen. Let’s explore and find your favourite one! Asahikawa ramen style is mainly a blend of pork and chicken stocks and a seafood broth, making for a rich and complex soup with a shoyu base. Yokohama is better known for ie-kei ramen, a viscous, salty, and fatty tonkotsu-shoyu style pioneered at Yoshimuraya in 1974. Hidatakayama’s ramen is sometime called “chuka soba” or Chinese-style ramen in this region in order to distinguish from Japanese traditional noodle used a soy base. The soup is mainly made from bonito,chicken and vegetables with Soy sauce and mirin (Sweet rice wine).Noodles are curly type. Broken pork bones are cooked over a high flame for days at a time here until the marrow seeps out, creating a smooth and creamy broth. 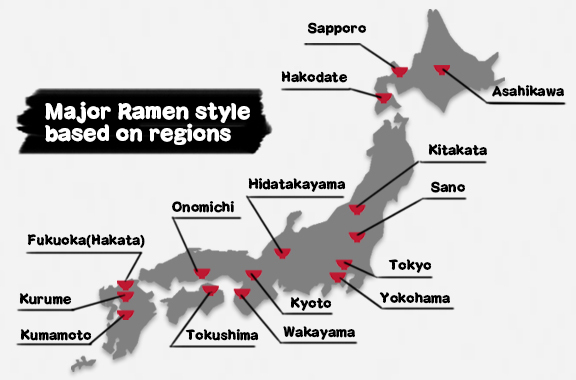 If you learn Ramen style by region more, these site（Lucky Peach and Is Japan cool? Ramen) will help you. West End is the most popular destination among foodies, and is also the most competitive Ramen area. You won’t go a block without seeing a Japanese IZAKAYA or Ramen restaurant in this neighbourhood. I tried Tonkotsu Shoyu and Tsukemen Original. 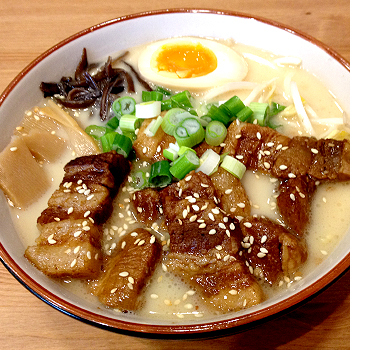 Tonkotsu Shoyu has very rich taste soup and the thick frizz noodle can hold it very well. The chashu is savoury and goes well with soup too. As far Tsukemen Original, I noticed it’s very similar to Taishoken’s Tsukemen which has rich dried bonito broth and thick noodle. Taishoken is Ramen restaurant group in Japan and famous for the father of Tsukemen style Ramen. 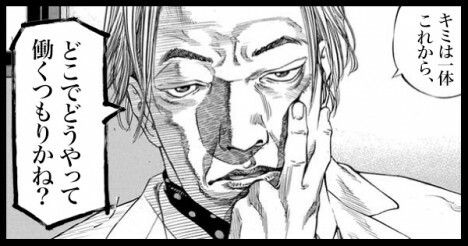 I heard that they’re actually descended from the Taishoken group. If you know the taste of Taishoken, it’s worth to try comparing the taste! I tried their signature, Miso Ramen. It made by a Japanese chef who had worked for Sanpachi Ramen in Vancouver. Sanpachi Ramen group is Sapporo style Ramen restaurant chain basically from Hokkaido, Japan. That means it has the typical Hokkaido style combination of corn topping with Miso soup and makes mild flavor in Ramen bowl. Their Chashu has the best thickness and balance of lean and fat for me. It goes well with the mellow texture of Miso soup.I also tried Tori Shio Ramen whose soup made from chicken broth and salt. The soup has delicate flavor and very light and mild salty taste. If you like lighter taste Ramen, I’ll recommend it. It’s actually “Tantan Men”, and it’s not “Ramen”. I couldn’t help but love the its name; “天下無双 (TENKA MUSOH) ”. It means “The Land’s Greatest/Unmatched Under Heaven”!! lol Sounds so cool. The Tantan Men hasn’t lost the crown as the ‘most ordered dish’ during Kingyo’s dinner hours since it opened. Apparently, the Tantan Men has gone through several ‘rejuvenations’, meaning it’s been continuously improved upon. The noodle is wavy , thick, quite filling, with a light crunchiness coming from the chives. 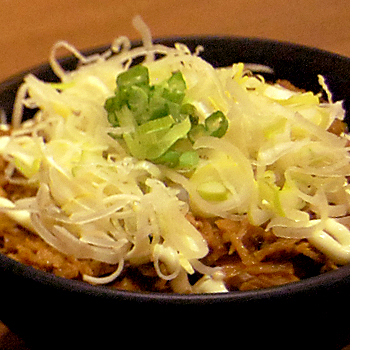 It compliments the NikuMiso (Minced meat seasoned with soy bean paste) perfectly. The soup is Tonkotsu-based broth, so it’s creamy and mild, yet sharp due to a generous heap of spicy chili garlic oil. Just by inhaling the back sesame aroma will make you drool. If you love spicy and creamy, this is the one. Please try our “天下無双” Tantan Men, the most popular dish at our restaurant since we opened. It’s even respected by other Ramen restaurants! You will become a big fan at the first bite! GYOZA KING is a Japanese IZAKAYA restaurant offering Japanese home-made dishes like Oden, Okonomi-Yaki and Grilled Mackerel…and of course, they have Ramen!! They have your three standard soup bases: Shio, Miso, and Shoyu. They’re open until 1:00 AM, so it is perfect time to end the evening of drinking with a hefty bowl of Ramen, just like a typical Japanese office worker. *We are still waiting to hear from them to listen to their story! We will update as soon as we can get more information. 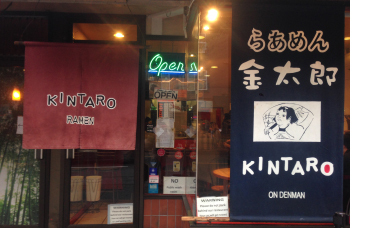 Kintaro Ramen opened in 1999, and is one of pioneer Ramen restaurant in Vancouver. Their soup is a tonkotsu-based broth, mixed with a speciality broth made from kelp and dried sardine, which gives it it’s rich aroma. They have your basic soup options: Shoyu, Miso, Shio…. and the intriguing cheese flavour! *We are still waiting to hear from them to listen to their story! We will update as soon as we can get more information. Opened along the busy Davie Street in 2014, Koika offers a wide variety of Ramen tastes with a unique and creative edge. The owner has gained experiences at 12 Ramen restaurants in Japan for several years. They are offering a wide range of noodle menus without MSG. The Ramen burger blew our Japanese reader’s mind away! I ran into their Ramen Burger one day, and I tried it as new adventure because I’d never seen Ramen Burger before in Japan. Actually this is also the first Ramen Burger in Vancouver. A ramen burger is a burger patty sandwiched between two ramen noodle buns. Koika’s buns are made of the same amount of a bowl of their ramen and it’s very filling. That’s worth to try. I especially love their Chashu Burger. I also tried their Tomato Ramen that is popular among their regular customers. It has fresh tomato flavour and rich chicken broth that is great marriage with ramen noodle. Actually it was a limited-time menu, but it has been revived because of calling from their fans. Santouka came to Vancouver from Asahikawa, Hokkaido, Japan. Asahikawa known for it’s distinctive style of Ramen. Since Santouka opened in Vancouver, there’s never been a day without a line up. Their basic soup is made from Tonkotsu, mixed with vegetables and dried sardine. There are three flavours: Shio, Miso and Shoyu. The Shio is my favourite! I love the combination of the creamy and rich soup with the semi thick noodle. Santouka is proud of their Ramen and said “We will offer the exact same taste as Japan”. To ensure this, the key ingredients such as noodles and sauce are imported from Japan. If you want to try it, you should be ready to wait at least 10-15 minutes!! It’s definitely worth the wait. This is their second location in Vancouver opened 5th November, 2015 on Robson. We will report this location soon. Please check the report of their first location in Kitslano. Hida Takayama’s style is from Hidatakayama region in Japan. Their style is termed “Chuka soba”(It means Noodle from China) to distinguish with Japanese traditional noodle made from buckwheat termed “Soba”. 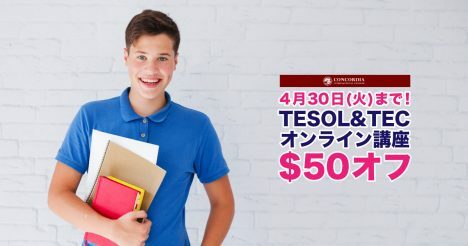 They have a nice selection of soups to choose from: soy sauce, shio, miso, spicy miso, tantan men, tomato and salad mix style. All their ingredients are all-natural/organic, so it’s grasped that niche market. 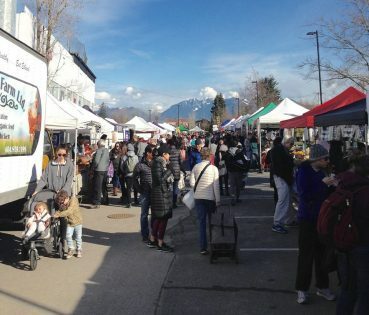 It’s located inside Robson Public Market, and parking is free. I tried their regular Ramen, and added a half-boiled egg & chasu to it. What most impressed me was their Tori Paitan soup, or Chicken-based soup. It’s low-calorie, healthy, full of collagen. It’s very light, and doesn’t leave your mouth oily and in need of water. 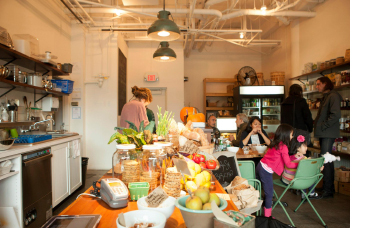 The soup is made from organic chicken and vegetables, so it’s perfect for health-concious Vancouverites. They have Shio, Shoyu and miso. The soup was light and refreshing. The noodles were straight, bouncy in texture. Even the chashu was less-fat, making you feel nice and full, yet unbloated. 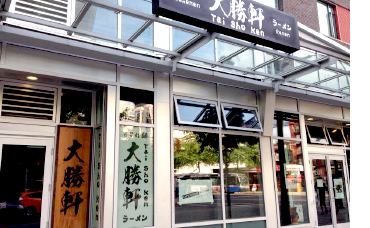 THE RAMEN MAN was opened in October, 2015 close to Robson St. 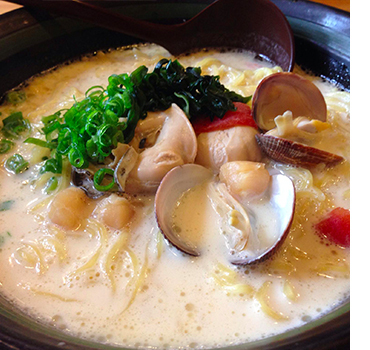 They are known for their rich “Paitan” soup, which reminded me of the ramen from the famous “Tenka Ippin” restaurant. Paitan soup is whitened tonkotsu soup, but here they use chicken instead of pork bones. On the menu, they have “Chicken and Clams”, “Rich Chicken Paitan” or “Chicken Paitan” and you can choose between two pieces of “Chicken Cha-Shu”, “Pork Cha-Shu”, or one of each. The “Rich chicken Paitan” in the picture was jam packed with flavors of chicken and vegetables, and I would give it 5 stars for Rich-ness! If you would like to eat the soup with rice, you can ask the waiter and they can bring you a bowl. They seemed to have ramen with Paitan soup base, rice combo meals, gyoza, and more on their menu. Alcohol is also available at this restaurant. It would be nice to try and visit this place at some point. 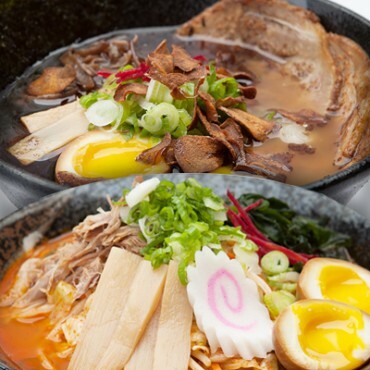 Downtown Vancouver is full of Japanese restaurants and Ramen places. Certain Ramen places may close before regular hours, if they run out of soup, so make sure to come early or book ahead if it’s during dinner time. 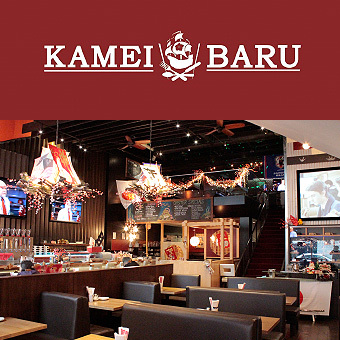 With a strong emphasis on seafood, Kamei Baru brings dishes featuring the four seasons of Japan. The restaurant is frequented by business visitors from Japan. The interior is decorated with seasonal decorations during holidays and sporting events. As it often happens with Japanese restaurants, if they run out of the daily soup stock, you’ll miss out on the Ramen. Make a reservation, or don’t go too close to their last call. You get the chance to try their Ramen during lunch time and after 9 pm. The soup is dried-seafood and pork-based. The noodles are hand-made by their chefs! They’ve got Tonkotsu Shio, Tonkotsu Miso, and Spicy Tonkotsu. The spicy one had quite a punch to it, and goes great with beer and gyoza on the side. 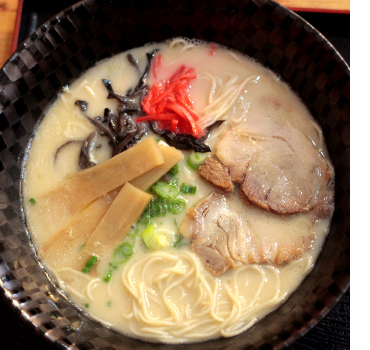 The Tonkotsu miso had a creamy taste, and the Tonkotsu shio had a rich aroma. During lunch time, the Ramen plus gyoza or sushi roll combo is $12.99. The gyoza was juicy and crunchy. Our speciality our the hand-made noodles. Daily quantities are limited, prepared to be a bit disappointed if you come in hungry around last call. Ask our servers what our special and seasonal menus are! Gyoza Bar is part of the restaurant group including Miku and Minami, known being frequented by Japanese celebrities and tv personnel during filmings. 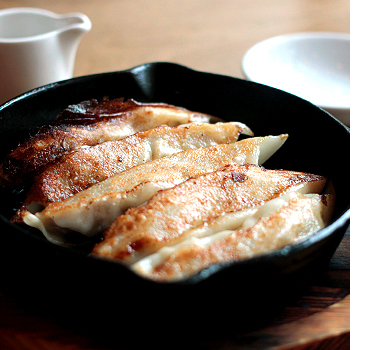 Their concept is to showcase Gyoza and Beer is an up-scale bar like atmosphere. Their style i different from traditional Japanese one but wort to try their Tonkotsu, chicken or tomato-based Ramen. Located right in the heart of the Granville street area, Shuraku offers delicious izakaya-style dishes. Have a Ramen to wrap up your dinner! Jinya is one of the most popular Ramen restaurant chain in Japan.They already have opened locations in the U.S. The restaurant in Vancouver is also very popular and usually has a line during meal hours. Their original “Tonkotsu Shouyu Ramen” soup is made from Tonkotsu broth, which they stew for over 10 hours, and their original recipe shoyu sauce. 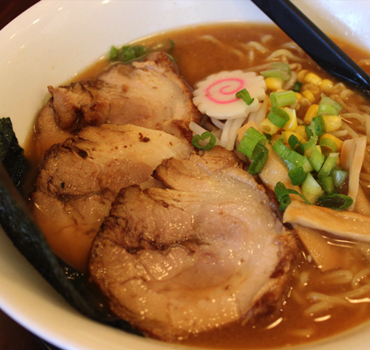 Their most popular ramen is the “Tonkotsu Shouyu Black Ramen”. 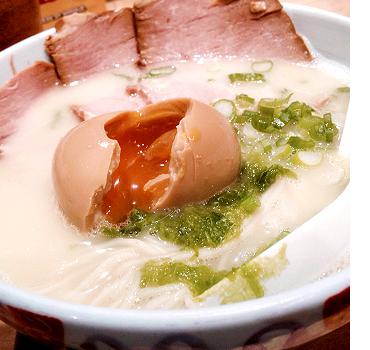 Its rich tonkotsu soup with roasted garlic has great aroma and is a perfect match with the soft boiled egg. 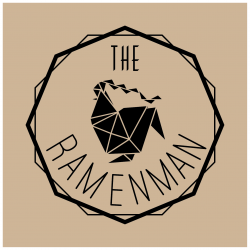 They are also offering seasonal Ramen and every one of them are very popular among our female writers, so make sure you check those out as soon as you get there! We already covered them once when they opened. 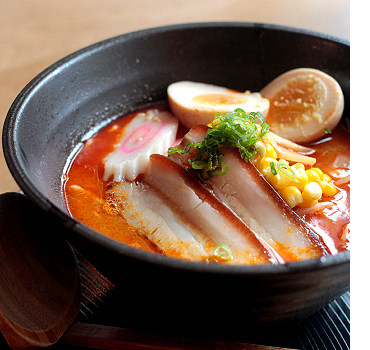 They have not only Miso, Shio and Shoyu Ramen but also tomato Ramen. Note that they get closed when their soup has run out. Ramen Gojiro opened in March 2016 with their very familiar looking logo and name. It is clearly a pun made on the famous movie “Godz*lla” and “Ramen Jiro” which is also a famous ramen restaurant in Japan. You’ve got to try the BAKAMORI if you come to Gojiro. 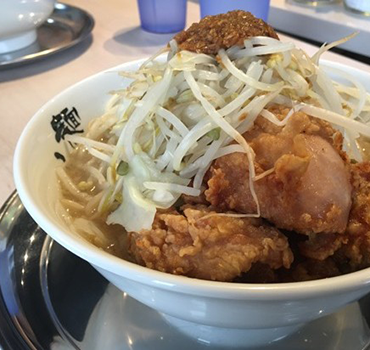 They put “Karaage” on top of the ramen which left a very western impression. The calory in this one bowl of ramen must be rediculous! So, I ordered the “Bakamori Karaage”. The volume of this thing was massive, and the garlic spice gave it a very strong flavor. The thick noodles were very heavy and firm, and will most definitely fill you up. You can also order the SPICY version which will give you the power of fire breaths and turning you into “Godz*lla” as you leave the restaurant. 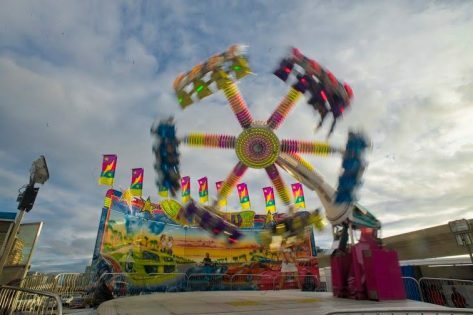 The price is fair and the volume of it was more than enough. This is turuely a stomach satisfying restaurant. There are also a tons of hidden gem restaurants in Chinatown. Yes, Ramen restaurants are too. The interior doesn’t look like a Ramen restaurant, but Ramen offered by Chef Hokuto is organic, healthy and tasty. 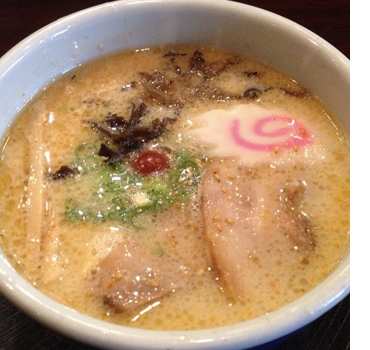 One of our reader recommended us their Miso Ramen. 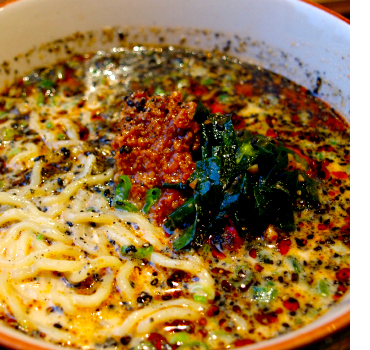 If you’re on the health concious side, give this Ramen a whirl. 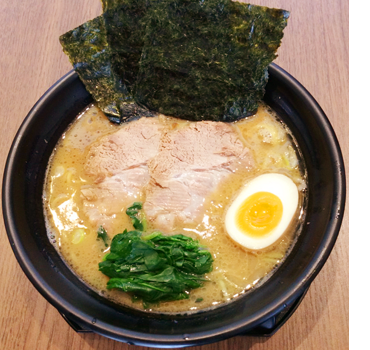 Opened February of 2015, this new-comer Ramen location is part of the Menya Kouji group in Japan. They offer the standard ‘CLASSIC’, garlic & black sesami oil ‘BLACK’, Italian style ‘GREEN’, Spicy ‘RED’, and the miso ‘ORANGE’. The noodles are thin and straight, matching perfectly with the unique soups. 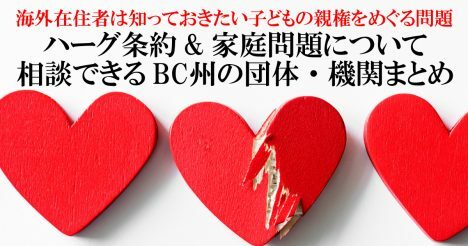 For the health concious crowd, you can choose the ‘lean’ Cha-shu instead of the fatty ones.Especially, writers from Fukuoka Japan really love their Ramen. Open in the Stadium-Chinatown area since 2015 is a Japanese style restaurant called TORAFUKU. There seems to be a dish called “Torafuku Ramen” but our staffs haven’t been able to visit the restaurant yet. We are looking to hear from you about this restaurant! 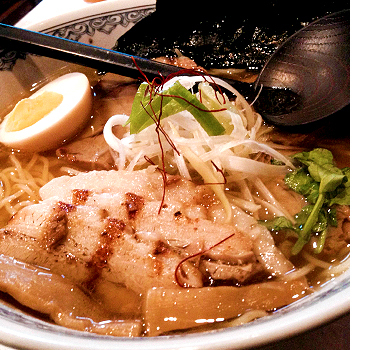 Stretching from east to west through Vancouver, Broadway is full of Ramen adventures. I’m unfamiliar with Miso Ramen because I’m from Hiroshima Japan, so this is my first Miso Ramen!! It is made from soup based on pork, chicken & beef, with rich aroma from taken from shrimp, making it a much lighter than your regular miso. During lunch time, you get a complimentary salad with its popular house dressing. They said some customer ask them the recipe of the house dressing. It was crowded even in 2pm, so I recommend to make reservation. 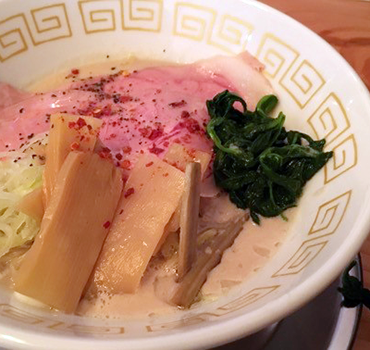 Benkei Ramen prides itself on creating simple and one of Japanese old-fashioned Ramen. They offer the basic soy sauce & shio, as well as gyoza & curry to go with the Ramen bowl. The soy sauce soup is made from chicken simmered over low heat over a long time, giving it a savoury yet still fairly light palate. It kept the taste even it’s heated by a microwave in my home because of its mildness. The chef, from Fukuoka Japan, makes the style of ramen called “Nagahama Ramen”. Myself, also from Fukuoka, felt like being back home when I saw the sauce for “Kaedama” (Ordering more noodles to eat with your leftover soup) and the overall atmosphere of the place. 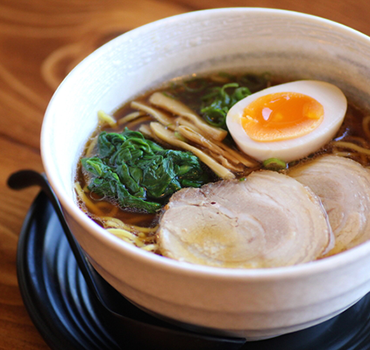 The ramen is made by a Japanese chef that preserves the traditional “Hakata Nagahama” style where the noodles are straight and thin inside pork based soup, and has the simple but classic toppings such as cloud ears, bamboo sprouts, red ginger, and Cha-Shu. The only difference I felt compared to the ones in Japan, was the soup being lighter in flavour which makes it easier for first-timers to try this particular style. This style of ramen was developed through generations of workers at the fishing ports in Hakata. 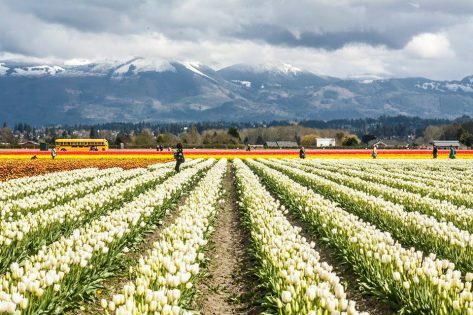 It would be wonderful to spread this flavour around to more people in Vancouver. 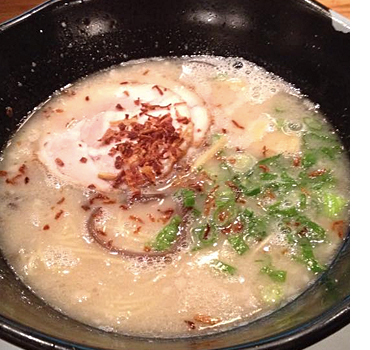 Please come and try our authentic Nagahama Ramen made by our chef who trained in Hakata. 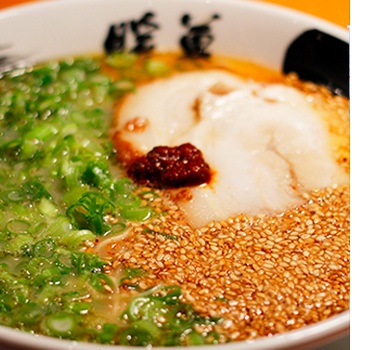 Our Nagasaki-Chanpon and Tan-Tan-Men are also very popular among our customers. The Jinya Ramen Bar that reopened in 2017 has a new location in the Kerrisdale area. For more info, check out the post for the downtown location! 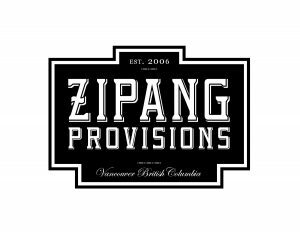 Previously called “Zipang Sushi”, has changed their name to Zipang Provisions and has moved to 3068 Main St. We have received information about this restaurant having Miso Ramen and Shoyu Ramen. 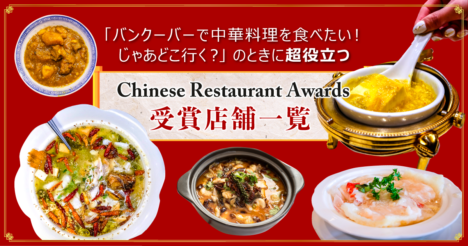 We are seeking for more information about this restaurant since we have not been to the place yet. Please feel free to send us your opinion! The restaurant who won the No. 1 spot of Kyushu’s Best Ramen has been operating in Vancouver since the May of 2015. Danbo is a chain restaurant where there are 8 locations in Fukuoka Japan, and over 20 all over Japan. Myself included, the staffs from Fukuoka were extremely excited to hear that Danbo was coming to Vancouver. The ramen contains the classic thin-straight noodles with simple toppings such as Cha-Shu and green onions. This ramen gives out this sensation of the traditional ramen in fukuoka. The “Negi-Goma Ramen”(Green Onions and Sesame Ramen), contains double the amount of green onions and sesame compared to a regular bowl. *It reminded me of the sesame grinder or the one that goes “wrrrrrrrr-” with the sesame inside (if you know what I mean)* They also have the same side menus that they offer in Japan; Some of them being Gyoza with spicy fish egg rice and Cha-Shu Vegetable Donburi. 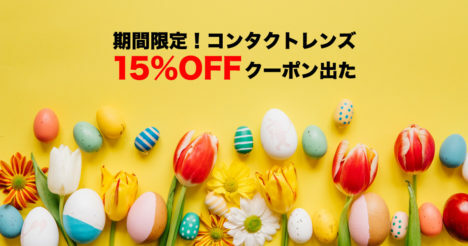 Of course, you can order different toppings such as seaweed and boiled eggs, and “Kaedama”(Ordering more noodles to eat with your leftover soup). Rajio replicates an old fashioned traditional “Izakaya” (Japanese Pub) and is located in Kitsilano. Their main menu is the Osaka Style Deep Fried Foods, but you can also order ramen. One of the ramen I had was the “Kiwami Shrimp Miso Ramen” (Kiwami meaning extreme or perfection). The most distinctive feature about this particular ramen was the pile of “Sakura Ebi” (Dried, crispy, mini shrimps) that not only gave off the great aroma of seafood, but also the crunchy texture that kept me eating bite after bite. The soup base was made with a blend of pork and shrimp based soup mixed with 3 different kinds of miso, which made it very rich and delicious. I understood the reason why this ramen has the word “Kiwami”, it is truely a perfection. Aside from that one, I also had the “Omar Shrimp Shio Ramen”(Omar shrimp is similar to lobster). The soup base was a simple, light blend of salt base soup and pork base soup, which allowed the aroma and the flavour of the lobster to become more emphasized. A single scoop of the soup is enough to experience the soup packed with flavour. Since they closed down in 1995, it has been 22 years. They have finally come back! 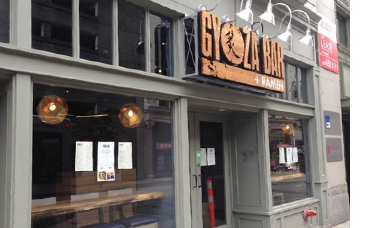 The restaurant previously known as “Gyoza Paradise” has changed their name to “Gyo Para Gyoza & Ramen Bar” and has come back to the Kitsilano area. They use the same recipe that they offered since 1953, and they deliver the most nostalgic flavor that had the kindness to warm my heart up. Also, their gyoza is all homemade, and the outer skin is very firm, capturing all of the juicy flavors inside. The more you chew, the more flavor you get to the point where the veggies inside tasted a bit sweet. We also tried the fried rice which was very classic and simple but had the perfect amount of flavoring on top of the Japanese rice on the pan. Gyo-O is famous for their seafood Donburi, and is a sibling store of “Gyoza-O” (Gyoza King) in Downtown. We had received lots of recommendations about this restaurant and I have decided to try it out. Many of our female audiences had recommended the “Oyster Milk Ramen” which contained big chunks of oysters sitting on top of the rich and creamy soup. It was almost like a seafood carbonara. Not only were there oysters as toppings, but there were also other kinds of seashells like scallops and clams. The seafood blends in perfectly into the rich soup which deepens the flavor of the entire dish. If you like creamy or rich soup and seafood, this may be the one to try. As the name suggests, this restaurant offers a variety of seafood dishes including “Lobster Ramen” or others that contain lots of different seaweeds. Another sibling store of “Gyoza King” and “Gyo-O”, is this place called G-men. We have been receiving a lot of recommendations about this place as well. We have heard that people often bring canadian colleagues to this place, but there are a lot of Japanese fans as well. There is a big sign up at the front that says “SUSHI&LARMEN” and was thinking why it says “larmen” instead of “ramen”. But according to the information we have been receiving, the chef is a tough looking Japanese “Ojisan” (old man), who makes very good tokyo style Shoyu Ramen. There are no special additives that is being used in the soup, and our staff is eager to try this place out. This “Ie Kei Ramen” or Home Style Ramen, was developed during the 70’s in Yokohama, Japan. 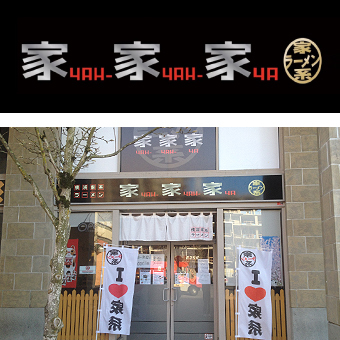 The chain Yah-Yah-Ya Ramen opened it’s first North American branch in Richmond, BC. The classic “Home Style Ramen” consists of Shoyu Tonkotsu soup base and thick noodles. The standard toppings would be seaweed, spinach, and Cha-Shu. Since arriving in 2014, this restaurant has been gathering attention from not only Japanese customers but many locals around the area. Their ramen, with the firm noodles and the Shoyu Tonkotsu soup, felt very familiar since their original location is exactly where this style of ramen was invented. Having 4 locations in Tokyo, Yah-Yah-Ya Ramen has made the decision to bring their flavour to North America. Just like being at home, you can specify how your noodles should be cooked, how much oil you want in your soup, how rich the soup is, and you can even ask for Cha-Shu with or without the fat. The soup is a very classic and nostalgic taste of home, and the same recipe from Japan has been brought here as well. However if you would like to try the most authentic flavour of soup, the restaurant recommends you to order with the “Heavy Taste” option. This style of ramen is very rare in Vancouver and, though the noodles feel a bit thinner than the real deal, the firm texture and the flavour reminded me the taste of home. I personally felt like I would be coming here often, and I managed to finish both Shoyu and Miso Ramen this time. 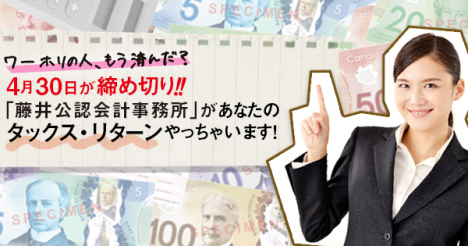 A very familiar chain, having 4 locations in Tokyo has arrived in Vancouver! 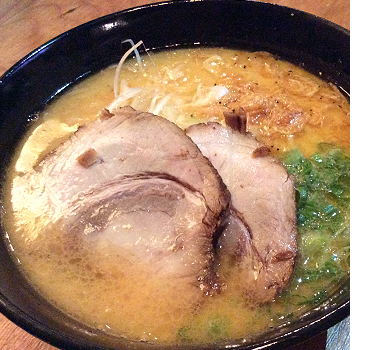 We bring the traditional “Home Style Ramen” which blends the Shoyu Ramen with Tonkotsu soup (pork base soup). We also have the familiar “Shio”, “Miso”, and “Spicy Miso” soup flavors, as well as being able to customize your noodles, taste, and oil of your soup. Would you like to have some Gyoza or some Cha-Shu rice bowl with your ramen? We are in the plaza near Yao Han Centre. Please come visit us if you come to richmond! 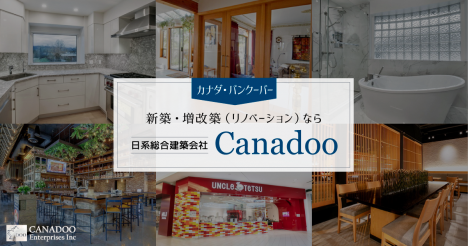 From “Niigata, Japan” the “Sanpou Group” opened a chain restaurant in Richmond. 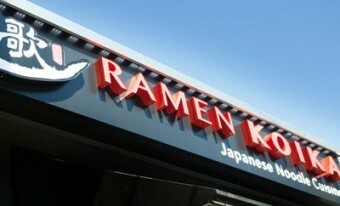 Despite them being a chain restaurant, they deliver a proper Japanese flavor to the west coast. The soup is made from simmered chicken, pork bones, and veggies, which is called “Niboshi”. It truely reminded me of the Japanese style ramen. I would personally recommend the “Niigata Shoyu Ramen”. 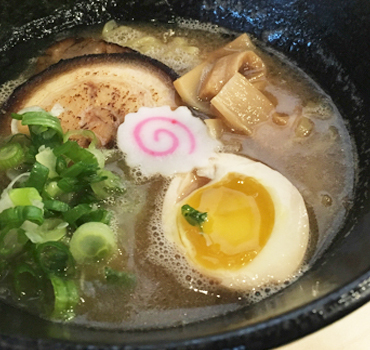 Hakkaku Ramen gathers attention from many local ramen lovers, and we have received numbers of recommendations from our readers. I would love to go visit and make a proper review for this restaurant. Since 1994, Yaguchiya has been offering “Ie-Kei Ramen” in Yokohama, and they have finally opened a location in North America! They have 5 flavors including the “Yaguchiya Special Ramen”, “Shoyu”, “Miso”, “Shio”, and “Spicy Ramen”. The staff has not been able to visit this place. 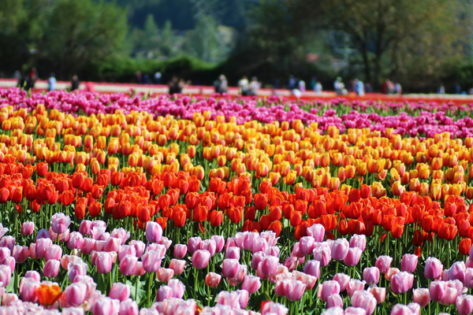 We are looking forward for your information about this place. The restaurant has opened in December 2013. 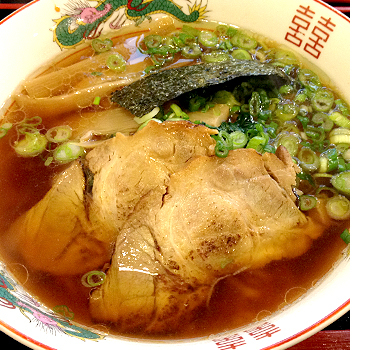 This time, we had something quite rare in Vancouver called the “Kakuni Ramen” (kakuni = simmered pork). The soup was a pork base Tonkotsu Soup with great flavour, topped with soft simmered pork. All the ramen menus come with a flavored, boiled egg. The Chinese owners spoke very fluent Japanese, and had trained in a Japanese restaurant for more than 10 years. 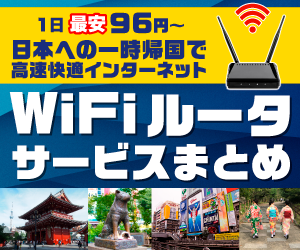 They are very familiar with the Japanese taste and delivered something extremely close to what stores offer in Japan. Apparently, Japanese families that live in Surrey, and even guests from White Rock come to eat at this place. We have been receiving numerous recommendations from our audiences as well. 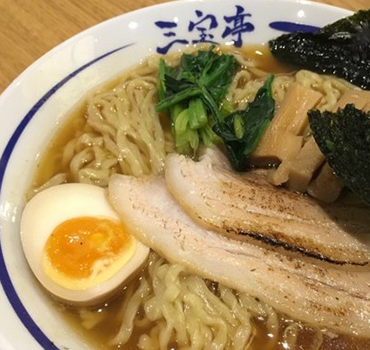 Our ramen consists of our unique noodles and the deeply flavoured soup, soft and tender Cha-Shu, and the flavoured boiled egg, that delivers the most delicious harmony to our customers. 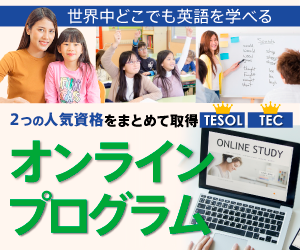 Please come out to try it! While Sushi Gio isn’t in Surrey nor Coquitlam, this korean owned Japanese restaurant offers the limited “Tonkotsu Shio Ramen” every Wednesday. The restaurant seems to only offer 10 bowls of these per week. The employee here has trained in the famous Japanese Tempura restaurant “Ginza Ten-Ichi”. I am curious to see how the limited Wednesday ramen tastes.